When we began our business in 1989, vinyl lettering was state-of-the-art and we were excited to be the first in the Valley to offer a new concept in signs and banners. 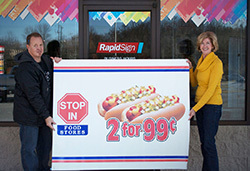 Our customers accepted this new solution to signage needs with enthusiasm, and have blessed us with many very successful years. I feel a deep sense of gratitude for each customer, and the business you have sent our way. Today, state of the art is digital graphics, and just like back in 1989, we were early to offer this new technology. With our sophisticated new digital equipment, we can now create full-color signs and banners, vision (see-thru) window graphics, vehicle graphics, full color labels and decals. And, yes, we still cut vinyl letters! We offer one-stop shopping for almost every promotional need - now including advertising specialties. Please take a minute to look over our list of services on the home page and to learn more about our new services. Our goal is to be the Best Sign Solution under the Star.